In the Giza Plateau in Egypt, at the base of the Pyramids, site one of the largest and most mysterious statues on the planet. Two-and-a-half football pitches long, seven-stories high, and twenty-feet wide, it stares into the distance with the nose-less face of a man but reclines on the rocky ground with a body of a lion. When and why it was built as well as whose face it bears remains a hotly contested subject. Its name is the Great Sphinx of Giza. 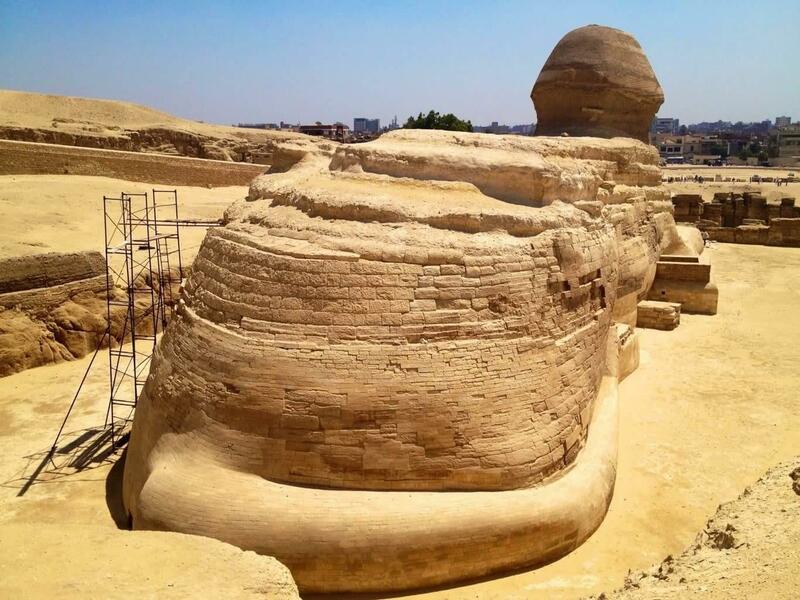 Yet despite its size, the Great Sphinx of Giza shares a similar fate as the nearby city of Giza: That of being in the shadow of a larger, more famous rival. Giza though a large city, is no match for Cairo on the opposite bank of the Nile. Yet it makes up for its smaller size by hosting the country’s greatest monuments, the Great Pyramids. 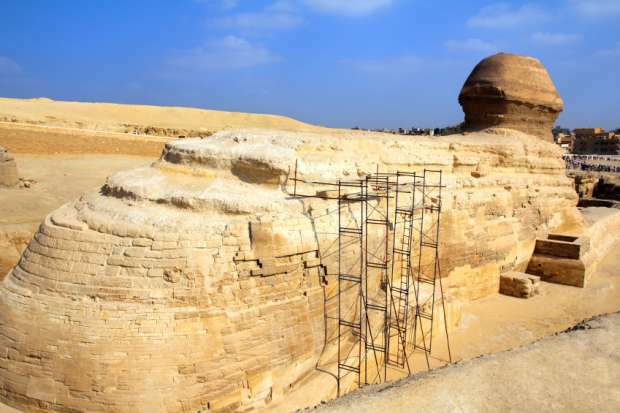 Likewise, the size of the Sphinx pales in comparison to that of the nearby Pyramids. And like Giza City, it too make up for it, but with mystery. When Was the Sphinx Built? 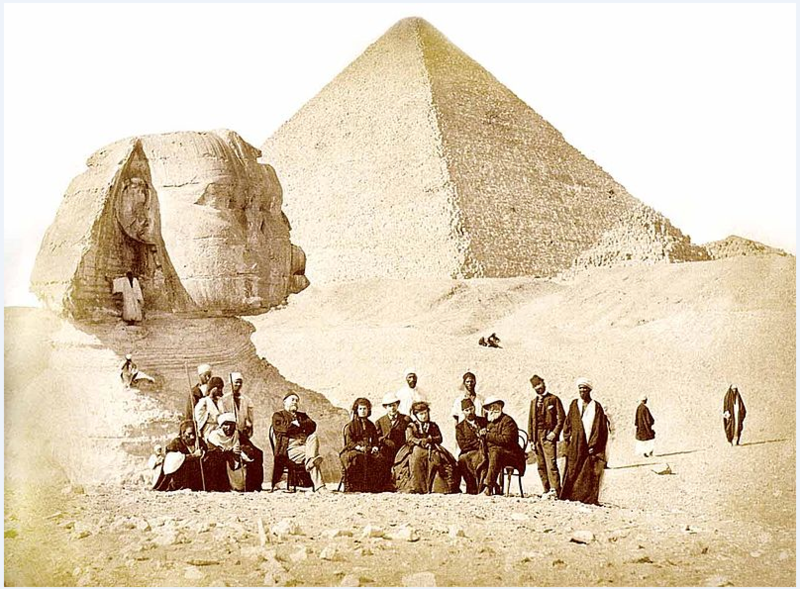 When the ancient Egyptians first dug it up from the sands 3,500 years ago, the Sphinx and its origins were a mystery. According to legend, Pharaoh Tuthmosis IV fell asleep in its vicinity and then had a dream in which the monument commanded him to unearth and restore it, which he did. Since then, the puzzle surrounding the date of its construction has remained unsolved. However, after much debate, present-day archaeologists have settled on 4,500 years ago during the Old Kingdom, based on their belief that Pharaoh Khafre built it. They came to this conclusion after studying the face of the Sphinx, which bears a striking resemblance to Khafre, the builder of Egypt’s second-largest pyramid. Others, however, claim that it resembles his father Khufu or his brother Djedefre, so one of the two built it. No one can know for sure, seeing that no inscriptions to that effect exist, even on the Sphinx itself. Why was the Great Sphinx of Giza Built? In ancient Egyptian, the name of the Sphinx translates to The Living Image of the Sun God. The structure was, therefore, a religious object linked to the sun-worship cult, which explains why it faces the rising sun and why later pharaohs worshiped it. For it to bear the face of a pharaoh means only one thing: That he wanted it to restate his divine nature to the world. And as sphinxes protected the religious buildings adjacent to them throughout the ancient world, it could be that the builder likely expected it to play a similar role over the Pyramids. 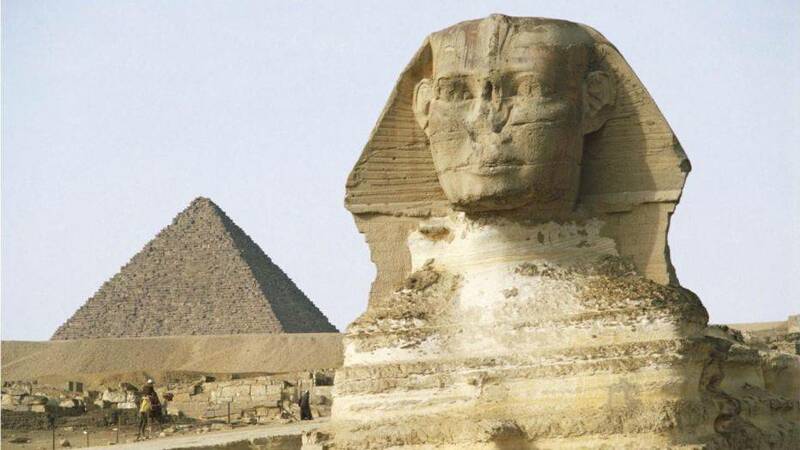 How the Sphinx Lost Its Nose? Legend has it that when Napoleon visited Egypt, his soldiers aimed cannon at the Great Sphinx of Giza and blasted off its nose. Yet nothing could be farther from the truth. 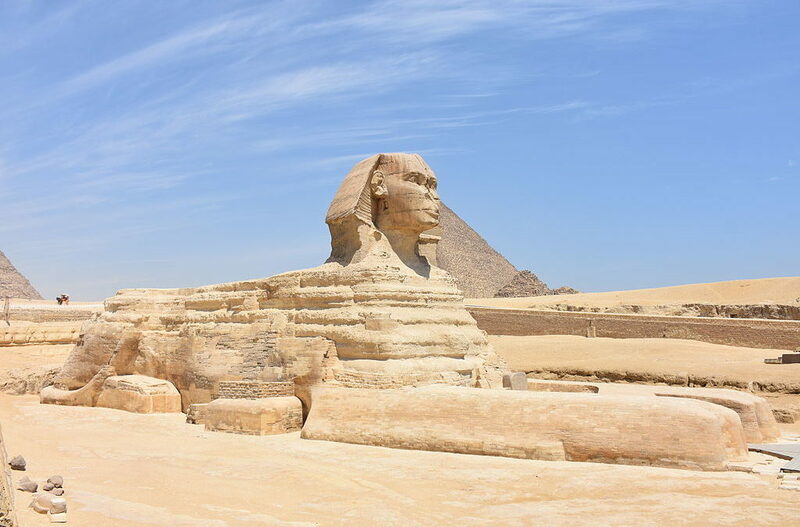 By the time Napoleon arrived, the Sphinx had been without a nose for centuries, and three centuries earlier, a 15th-century Arab historian had recorded the reason why. Apparently, a religious zealot, outraged by the devotion offered to the structure by the locals, chiseled off its nose to desecrate what he considered an idolatrous statue. For millennia, the Great Sphinx of Giza has posted more questions than it has offered answers. And despite advances in archaeology, its mysteries remain as enigmatic as ever. And they are likely to remain so in the future.